Some of you may know that I had the opportunity to test and review the HP ElitePad 900 back in early 2013. Back then, this was one of HP's first tablet PCs running Windows 8 (32-bit) and it was powered using a 2nd generation Intel Atom processor. The ElitePad was unique compared to most other tablet PCs in that it was designed to fit with various expansion sleeves and accessories that extended its capabilities. In the early part of 2014, HP released the updated ElitePad 1000 G2 which is powered by a 3rd generation Intel Atom processor and it runs the 64-bit version of Windows 8. The 3rd generation Atom processor is much faster than its predecessor and it consumes much less power than the Intel Core processors. So, the ElitePad 1000 is still light and thin and it offers all-day battery life. 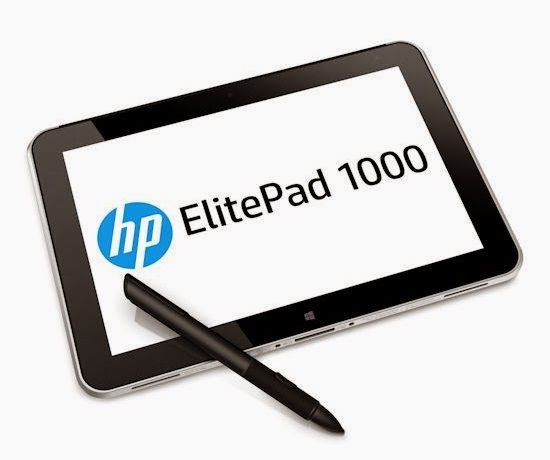 Over the next few weeks, I'll be writing more about my experience using the HP ElitePad 1000, so stay tuned. In the meanwhile, before you purchase a new tablet PC, consider whether you'll need to use an special stylus pen (active digitizer) for writing, drawing, scribbling, etc. with pinpoint accuracy. Or, do you simply need a device that will respond to your finger's touch? For me, a pen is critical. The options become more limited when you start researching tablet computers that support an active pen. The other major consideration is around the processor that's powering the PC. If you're going with a Windows 8 tablet PC, then most of them are either powered by an Intel Core processor (very fast, but consumes a lot of battery power, so will tend to be thicker and heavier), or an Intel Atom processor (relatively fast, thin, light, all-day battery life). The HP ElitePad 1000 G2 is one of the first tablet PCs that I'll be using that is powered by the 3rd generation Intel Atom processor and that runs a 64-bit version of Windows 8. Do you know how to tell if your PC is powered by a 2nd, 3rd, or 4th generation Intel Atom or Core processor?